We got on a boat to spend a couple days on Railay and meet up with Mostafa (guy I met through mountainproject.com). We arrived to Railay a little before 9am, found Mostafa at the resort he was staying at and ate breakfast. Then it was off to Wee’s Present Wall for some climbing. 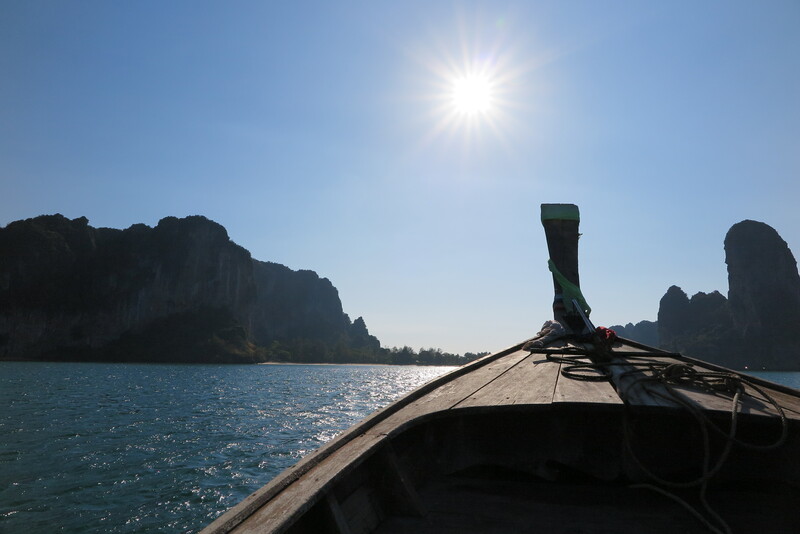 Morning longtail boat to Railay. We climbed a lot of things. Yoga friend Erica also met us at the wall a little later. I Don’t Know 6a – Onsight, Still sharp rock but a better climb. Hello Christine 6a+ – Toprope, Awkward moves near the start. Rest of the climb is good though. 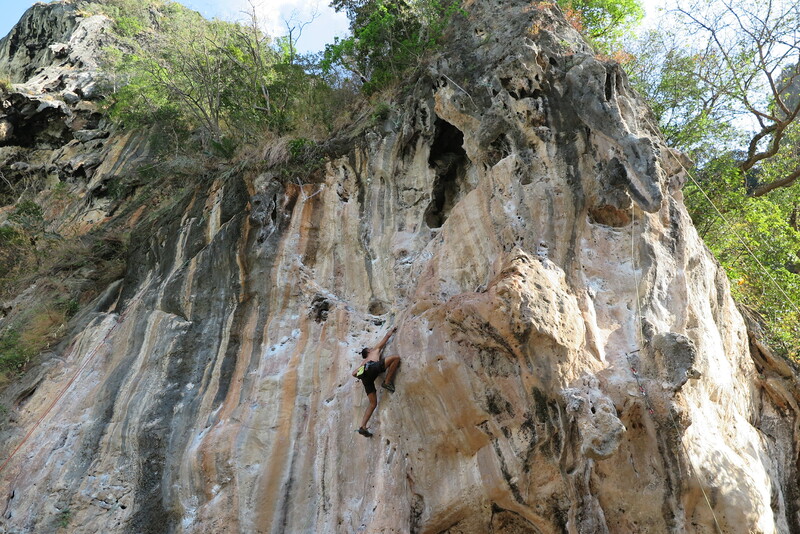 Milky Way 7a – Toprope, Shares the same anchor as Hello Christine 6a+. Fun to try something hard but I could only do the first couple moves. A Man Can Tell A Thousand Lies 6a – Onsight, Really fun chimney-like climb. A little runout but easy climbing. 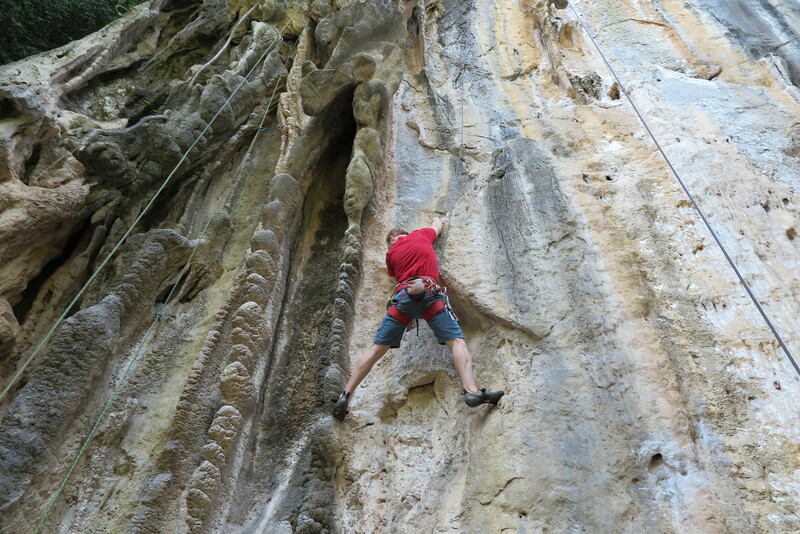 Same Same But Different 6b+ – Toprope, Very difficult start. The rest of the route is fun though. Roi Et 6a – Onsight, Very sharp rock. Not a lot of fun. 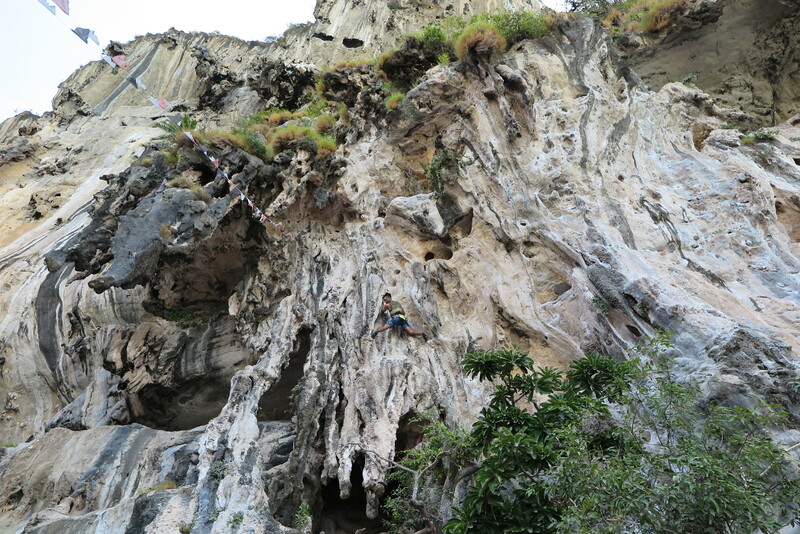 Ling Rong Hei 6b+ – Toprope, Fun climb that follows a crack most of the way to the top. Anong showing us how to climb a chimney on A Man Can Tell A Thousand Lies 6a. Erica leading Same Same But Different 6b+. Uncool toprope of Hello Christine 6a+. When we finished at Wee’s Present Wall, we ate lunch then headed over to 1-2-3 / Muay Thai Wall and climbed a couple more things. 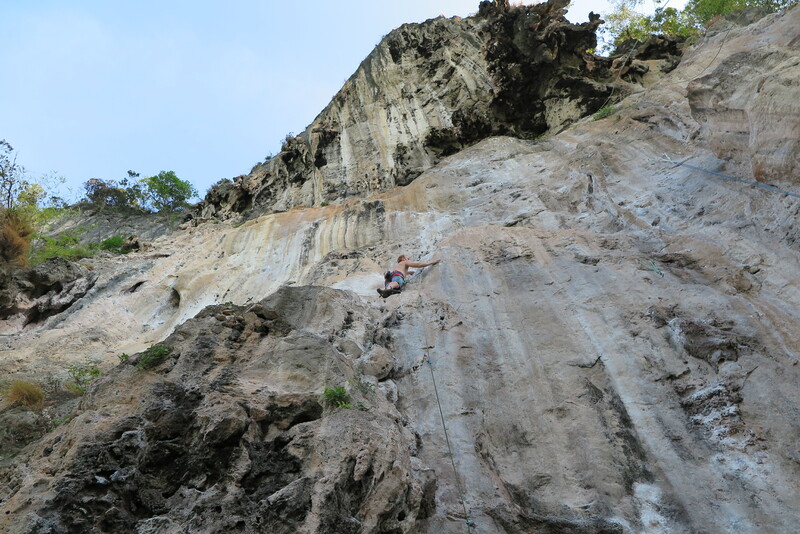 Nuat Hin 6a+ – Onsight, Fun climb up into a cave. A little pumpy in the middle. Make A Way 6a+ – Onsight, Super stoked to get the onsight. Jug haul to the top with a ballancy section in the middle. Mostafa looking like a boss on Nuat Hin 6a+. Onsight Make A Way 6a+. After Climbing, Anong, Mostafa, and I walked to Ton Sai to find a room. Got a massage, ate dinner, drank beer, and saw a fire show. It was a pretty good day. Took it easy today. Did a few laps on Zak Attack 5 and Chutzpah 6a+. This entry was posted in climbing on February 23, 2015 by kph76. The plan for today was climb McLovin 6b. I was going to warm up on one of the easy climbs EFZ 6a+ or Zack Attack 5 so I would be fresh. Well, the plan changed. Martin was there with Dorothy getting ready to put up Buzzsaw 6b. Dorothy was rather tired after a climb she did so Martin asked if I could belay him. After a little trouble at the second bolt, Martin made it up to the anchor. Props to Martin for starting to lead 6b’s! There’s a tricky move between the first and second bolts. Falling here would be very unpleasant so I have not tried leading this route yet. After Martin came down I figured I might as well try it on top rope. So much for an easy warm up. Some new beta made the start easier and the tricky section felt better. The rest of the route is all about using your feet efficiently and I made it up to the top without much trouble. Anong gave it a try then Martin went up again. 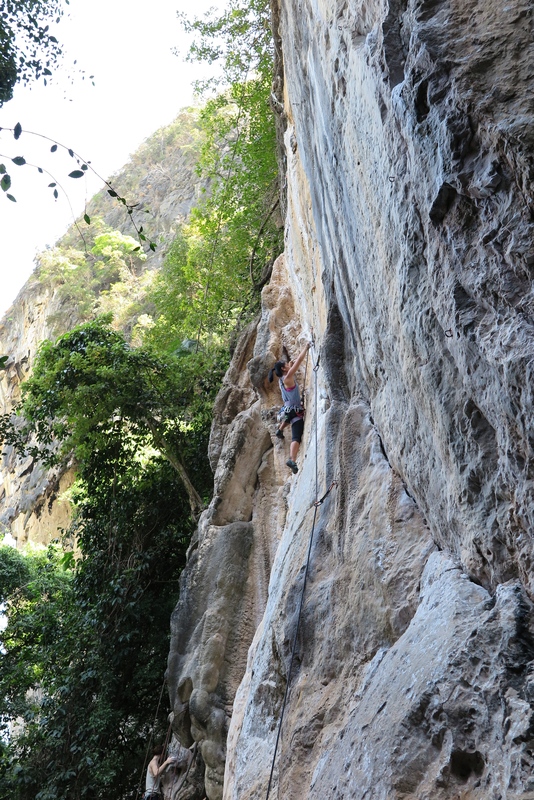 I climbed again and am starting to feel much more confident on the start. Even though it’s a 6b I actually wasn’t that tired and was feeling good so I moved over to McLovin 6b to give it a try. In the back of my mind I really wanted to send but wasn’t too worried about it. I just wanted to climb it a little better than I had done before. I set off and am climbing pretty well up to the crux. Which was my previous high point before taking. There is a really good fist jam so I was able to get a pretty good rest in I calmed my breathing and went for it. I made it through the move and there’s actually another pretty good rest here before one more move and clipping the next sling. Another short rest here, shake out and chalk up. I get up to clip the next sling and now I can relax. 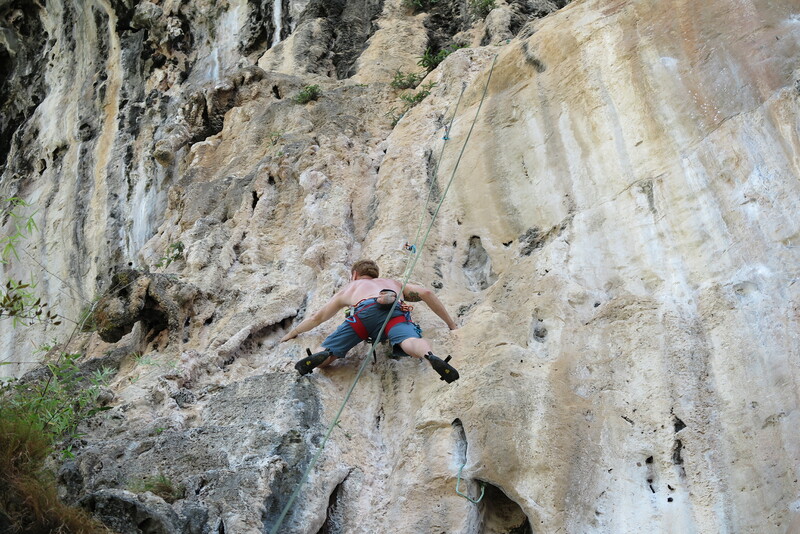 At this point I’m thinking maybe I will send so I try to climb efficiently, look for good feet, and rest when I can. Before I know it I’m at the anchor. Yay! I learned, or perhaps re-learned a few good lessons on this climb. Take rests when you can. There are 6 or 7 good rest spots on this route. I used every one of them. Keep moving even if tired and pumped. There might be a good spot to rest just 1 or 2 moves away. Use your feet! Does the next hand hold look too far away? Chances are there are more food holds to get your feet higher up and bring it within reach. Steady deep breaths helps keep you calm and brings much needed oxygen to your muscles. 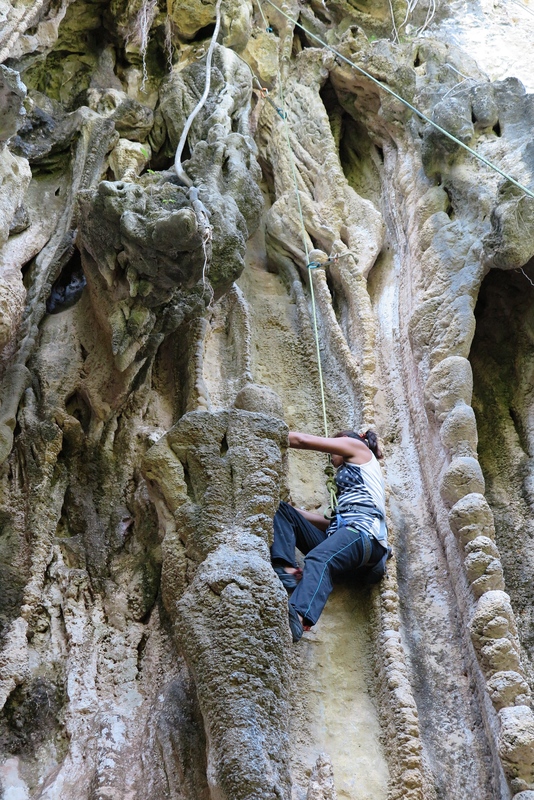 After I came down Anong tried but the start is too difficult for her so I climbed it one more time on top rope to clean the route. After I came down I was ready to go home. Tired, hungry, and a little dehydrated. But when I was getting ready I noticed I seemed to be missing one quickdraw and Anong pointed out to me it was hanging from a sling on Around the Bend 6a+. So we went over there and I climbed one more route to retrieve my quickdraw. I climbed the first section with terrible style but I didn’t care. I was tired. Once up on the ledge I climbed the rest of the route well. By now it was 2pm. The sun was starting to shine on the wall and I was really hungry so we called it a day. This entry was posted in climbing on February 21, 2015 by kph76. I went climbing yesterday and did exactly the same thing as before. But when climbing Around the Bend 6a+ I used some different beta to get past the second bolt and it was a little easier. Apparently someone was watching me climb and said I made it look easy. Trust me, it wasn’t easy but it made me happy. 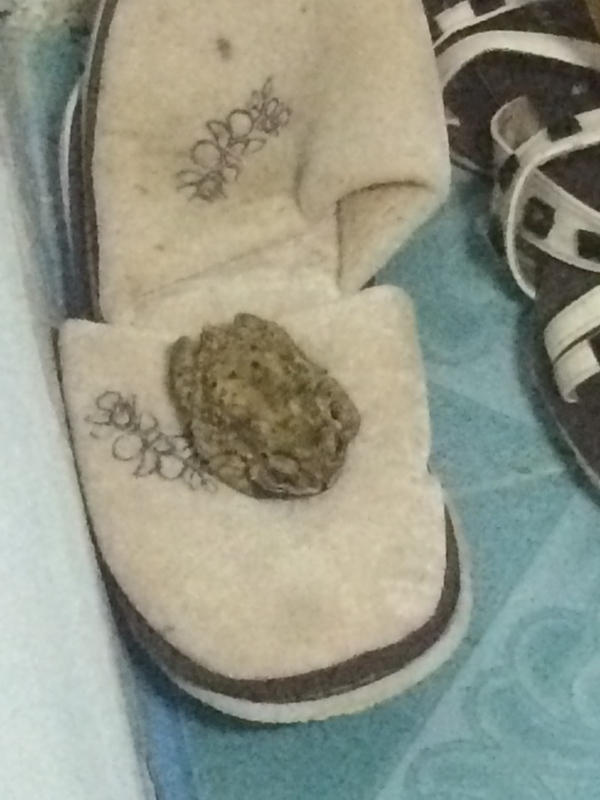 This entry was posted in daily life on February 19, 2015 by kph76. Warmed up on Zack Attack 5. Then set off to work on my goal for the day, to send the last 6a+ at the crag. It’s funny all the thoughts going through my mind. After warming up I was feeling confident. But after tying in and getting ready to climb I started to think I might not do it. Well, I got up past the first two bolts then clipped the first sling and was feeling a little better. The start of this route is rather difficult but eases up for a while after the third clip. The middle of the route traverses far to the right. It’s easy and fun climbing. 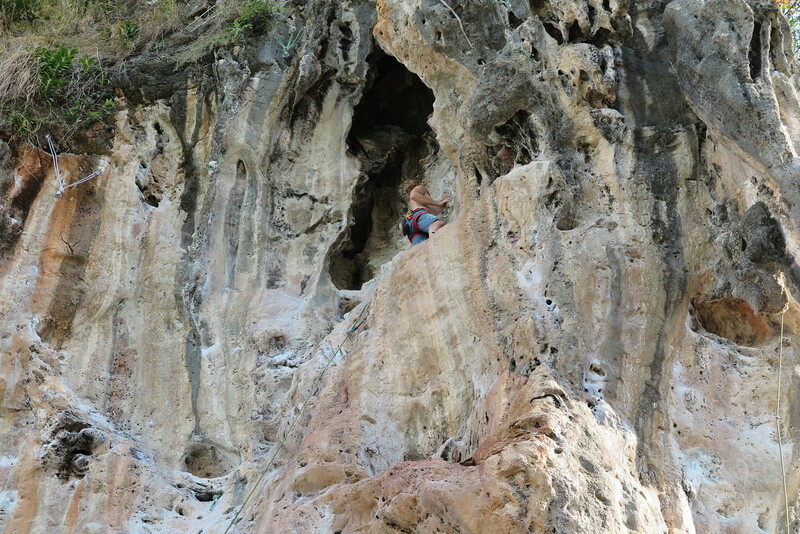 Then it gets into a weird section where if you continue up it’s thin and balancy but if you continue right and down climb a little bit there are much better holds and a tufa with good textured rock to climb up. Then in a little bit another weird section. I climb up to clip the bolt. 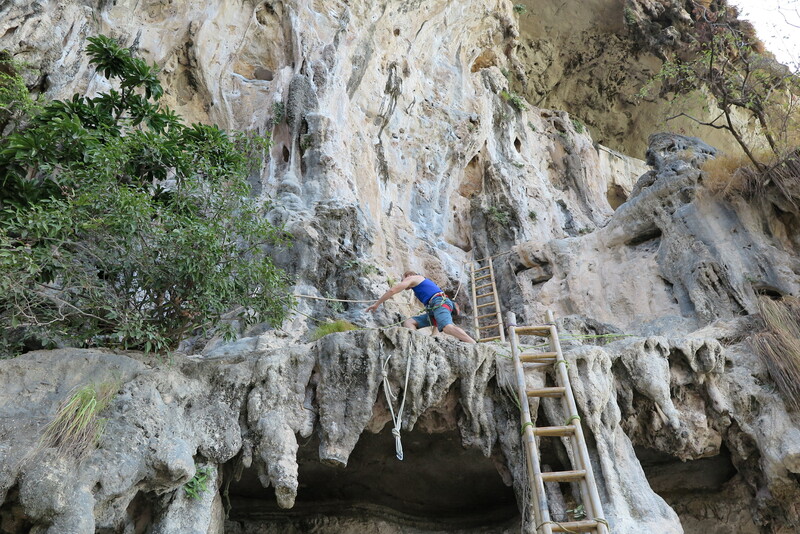 Then climb down and right a bit to get back on the tufa. At this point in the climb I’m feeling pretty good. Relaxed, not pumped. I know I’m going to send. A few more moves and I’m at the anchor. I finally sent Around the Bend 6a+. Now that I’ve done all the 6a+ climbs it’s time to start working on the 6b’s. This entry was posted in climbing on February 19, 2015 by kph76.